An article published in the journal “PeerJ” reports the recognition of a new species of mastodon that was named Mammut pacificus, the Pacific mastodon. A team of researchers led by Dr. Alton Dooley of the Western Science Center (WSC), Hemet, California, examined a number of fossils, finding in some of them what they consider characteristics different from the others, enough to define a new species that lived in the regions that today belong to California, Sierra Nevada and Idaho and is separated from the best known mastodon species, Mammut americanum, the American mastodon. Mastodon fossils were found for the first time in 1705 and since then many others have been discovered throughout North America. The story is a bit chaotic because in the 19th century several discoveries led to the attribution of different names to specimens subsequently recognized as belonging to the same genus and even to the same species. In the 20th century the taxonomic classification became more rigorous with the recognition of some species of mastodons even if discussions remain related to the attribution of fossils discovered in China. The history of Mammut pacificus could be a typical case of a species that was hidden in plain sight since the recognition of this new species was made after examining specimens from various museums but also specimens that were hosted at the WSC for eight years before being studied. The holotype, which is the specimen used in the original description of the species included in the research, is a partial skeleton listed as WSC 18743 included in the collection hosted in recent years at the WSC in 1995. For decades, paleontologists took for granted that Mammut americanum was widespread throughout North America but a few years ago Dr. Alton Dooley realized that some specimens discovered in California had teeth proportions different from those of the other mastodons by measuring the molars of specimen WSC 18743, nicknamed Max. Together with other researchers, he began a series of tests to shed light on those differences, which led them to a long research. That research began with the belief that the Californian mastodons were a variant of Mammut americanum that had developed some local adaptations in a population that had become isolated in the late Pleistocene. However, the more their research went on, the more the data from the discovery of specimens with the same characteristics as Max suggested that the Californian population made a separate species. 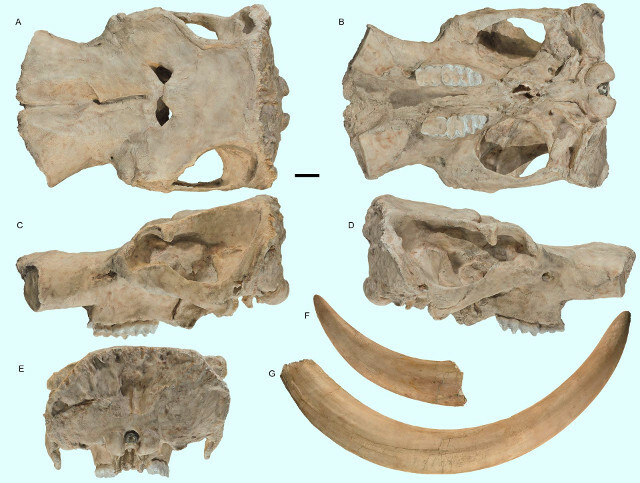 The image (courtesy AC Dooley Jr et al, PeerJ) shows the skull and tusks of Mammut pacificus holotype in dorsal view (a), ventral (b), left lateral (c), right lateral (d), posterior (e), the end part of the left tusk (f) and the right tusk (g). According to the analyzes of the various specimens, compared to Mammut americanum, Mammut pacificus had a wider femur, narrower teeth, six sacral vertebrae instead of five and no mandibular tusks present in about a quarter of the American mastodon specimens. The researchers believe that some desert areas created geographical barriers that led to an isolation of the population that became the Pacific mastodon. Mastodons were among the North America’s most typical extinct animals but are often confused with mammoths, also due to the name of their genus. Actually they are rather distant cousins ​​of mammoths and modern elephants that disappeared with the mass extinction of the so-called Pleistocene megafauna, of which it’s discussed whether it was a single event that went on for many millennia or the sum of various events. This new research could be the stimulus for a renewed interest in mastodons with new studies that today can also benefit from new technologies.